Maybe one of my focusing words yesterday also should have been "Zen," then I would have accepted the day for what it was and found something positive in it. Well in spite of the cold and the grey, I was able to get out to pick up something very zesty for lunch at one of my favourite restaurants - "Jules." They do wonderful French pastries, quiches, baguette sandwiches and more. I always get their lentil salad. It's delicious. In fact I shouldn't complain at all. If I am bored with Jules, I can always get a wonderful baguette with Brie, avocado and tomato at Thobor's which is about 5 doors down the street. In fact, in very short walking distance I have about 5 cafes that do take out or eat in lunches, rain or shine. Dieting is difficult!! I have been zealously working on new products, a new website and getting orders out. - Lots to do. 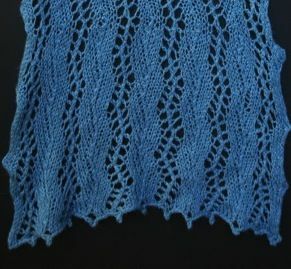 As part of work on a new product, I have to re-photograph some of my lace scarves done in Zephyr. Zephyr is the god of the west wind in Greek Mythology. I have mistakenly suggested in other posts that Zephyr was god of the south wind. Either way (the wind blows) it is a warm gentle wind that lends its name to a beautiful lace weight yarn in a wonderful spectrum of colours. Above is Stream Scarf in Aegean Blue. This was a fun blogging exercise. I'm sure that I'll continue to focus on concepts daily and maybe even post a few. There are so many words I'd like to use. Here is one I didn't - "Zeitgeist" and here is a website that looks interesting - Zeitgeist - Canada.